What's the first thing that comes to mind when you hear the word middle? If I were to require an answer from everyone before reading the rest of this blog, I would end up with a variety of responses and maybe, if I was lucky, a story or two. Maybe there would be a story about what it was like growing up as a middle child or maybe someone would share an experience from middle school. Someone might tell about how their father would take them to get donuts every Saturday when they were little and they would always get two donuts with cream in the middle or maybe someone would tell about how their little brother would only eat the creamy middle of Oreos and they would always be the lucky recipient of the leftover chocolate cookies. These are all uniquely different experiences and thoughts about the word middle. 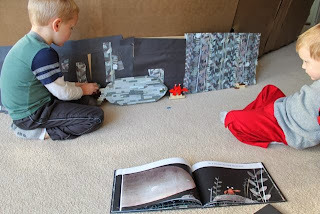 If I were to ask our birthday author, Jon Klassen, to respond he might tell us about what he thinks is the "most important thing" about picture books; The Middle Spot. 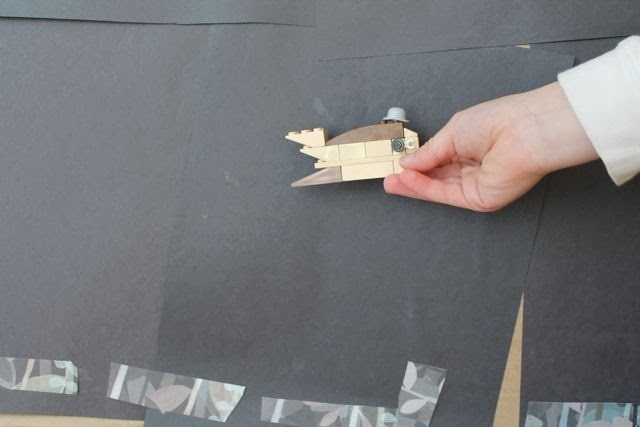 In a short YouTube video posted by WalkerBooksAus Jon talks about his experience with the middle spot when reading and creating picture books, "It was always something I remember being much deeper, much busier, much more colorful. But it wasn't. It was always so simple. It was amazing how much I ended up having put in myself when I was reading them. And working on them is the same way. You are never actually working on the actual story that your reader gets out of it.You are working on either the pictures or the words but neither one is the whole thing. You are never actually working on the what the audience is going to put together. 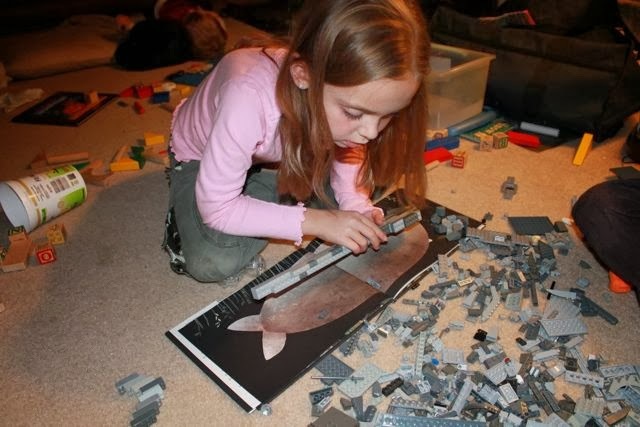 They are always going to put it together for you. And that middle spot is the most important thing. It is unique to every single person who reads it and its even unique to even you when you are making it." Jon Klassen is the first illustrator since 1947 to be awarded a Caldecott Medal and a Caldecott Honor in the same year. In 2013, he won the Caldecott Medal for his book This is Not My Hat and the Caldecott Honor for Extra Yarn by Mac Barnett. Amazingly, Klassen is fairly new to children's books. In his keynote speech at the Mazza Museum Summer Conference 2013 he said that he went to school for animation and then began working for DreamWorks Animation. While at DreamWorks, he worked on the animated films Coraline and Kung Fu Panda. After five years in animation, Klassen decided to pursue children's books. 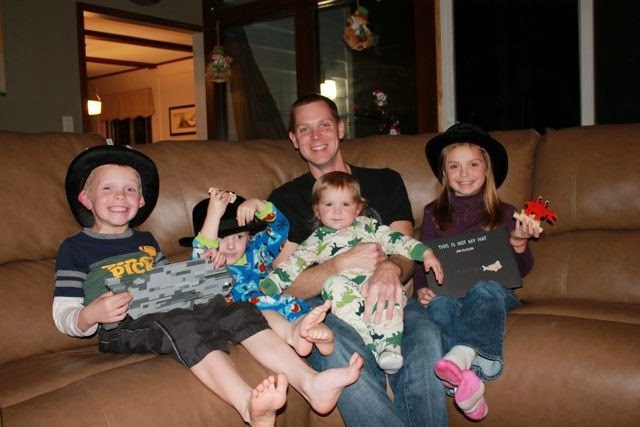 He published his first picture book, Cats' Night Out by Caroline Stutson in 2010. He described the emotions he was feeling early in his career to Publisher's Weekly, "I wanted to do books full-time really badly, but for a while it didn't look like it was going to be feasible." But, then he was awarded the 2010 Canadian Governor General's Award for children's literature illustration for Cats' Night Out and things started to fall into place. He published I Want My Hat Back which was awarded the 2012 Theodor Seuss Geisel Award and then House Held Up By Trees by Ted Kooser. After these three successful books Klassen had his remarkable year of 2013 with the two Caldecott medals and the release of The Dark by Lemony Snicket. Jon Klassen has had an amazing start to his career; really like no other author I have studied. My family had the pleasure to meet Jon Klassen at the Mazza Museum this past summer and were briefly able to say hello at the National Book Festival in Washington D.C. We were left with the impression that Jon Klassen will continue to succeed in children's books not just because he is extremely talented but because he cares about his readers, both young and old. 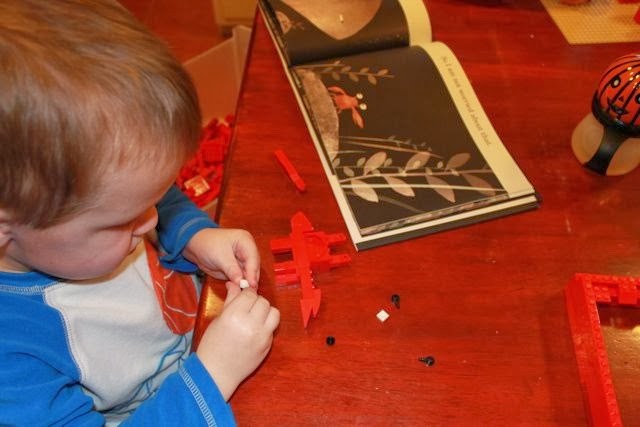 He wants to create picture books that work. He wants to make picture books that have middle spots for children and parents to explore and experience together. My three children enjoyed talking with Jon at the Mazza Museum. From the day I met Jon Klassen I had been wanting to think of an awesomely unique way to celebrate his birthday. I made things slightly more difficult for myself when I celebrated Mac Barnett's birthday in August using Extra Yarn illustrated by Jon Klassen. But then, one day, a few months ago, I was playing Lone Ranger Legos with my son and I noticed the hat that one of the Lego guys was wearing. I thought, "Hey, that's the same hat as the fish from This is Not My Hat." 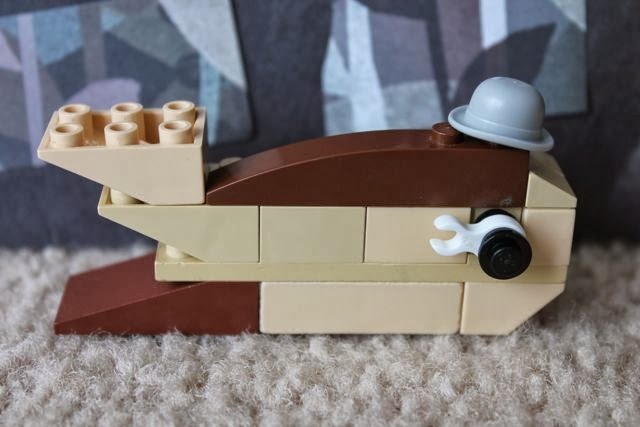 For weeks, I wondered if it was possible to recreate This is Not My Hat with Legos. I also questioned myself, "Why would I recreate the book with Legos? That might be a little weird." But, even with other hat-related birthday celebration activity ideas in mind, I kept coming back to the little Lego hat. 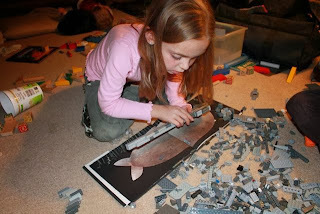 One night, our family needed an activity before bed, so I grabbed all of our grey-colored Legos and I asked my kids if they would like to help me build a BIG fish. We quickly settled on a plan and just went for it. 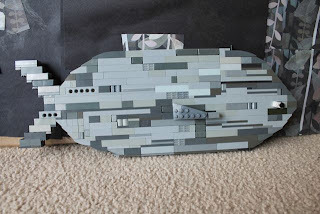 I created the initial middle base with tail fins. 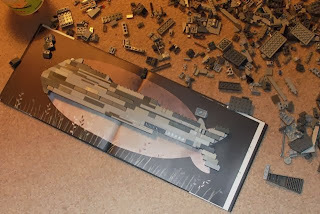 We made it to the size of Klassen's illustration in the book. 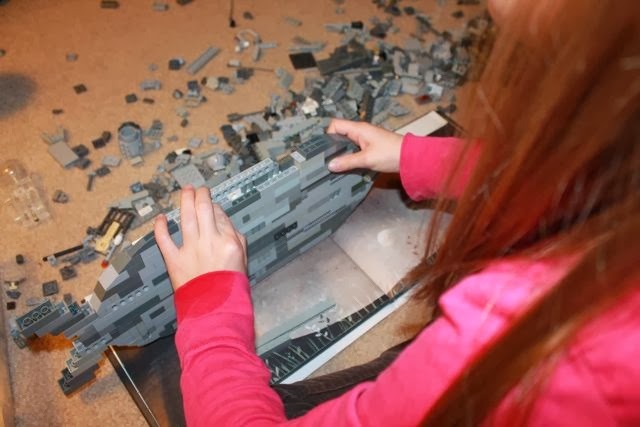 Then, my daughter started adding bricks one by one. 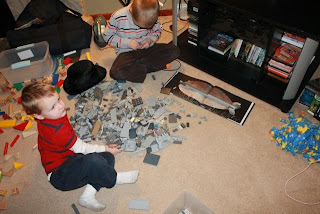 We were worried that we weren't going to have enough grey pieces in our collection to complete the fish after the first night. We thought we might have to call Grandpa, who loves Legos as much as we do, to borrow some of his. We worked hard. My daughter did a great job filling in the frame that I created. 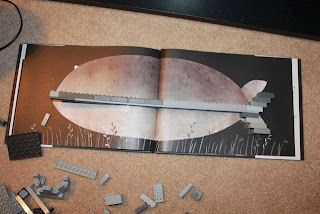 Our favorite part was coming up with the side fin. My oldest son and daughter has some heated discussion on what looked the best. However, they were both pleased with the final result. There were two other characters we needed to make -- the crab and the smaller fish, aka "The hat thief." 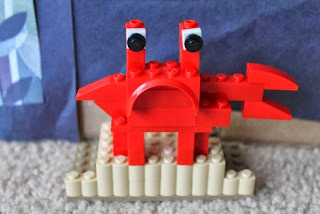 My youngest son enjoyed putting together the legs, claws, and eyes of the crab. Our characters were complete. 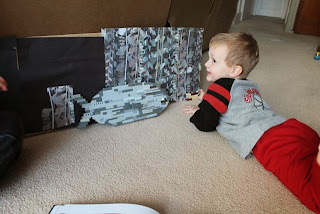 Now we needed to create the scenery or the setting. I cut a big piece of cardboard in two and then taped the two halves together to make a long strip. 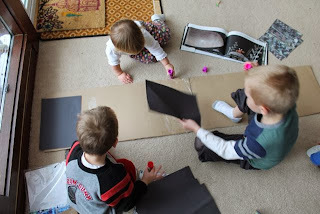 My children glued black construction paper to create the dark water. I acquired about seven sheets of paper with the water plants from the book printed on them. (On the back side of the sheet was an interview with Jon Klassen from Candlewick). 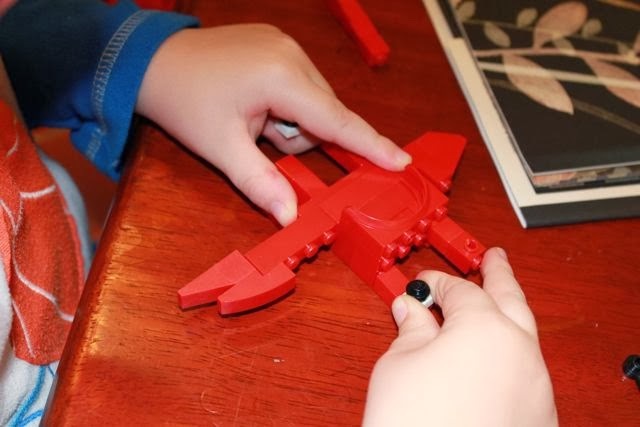 You can print plant illustrations from an activity kit from Candlewick -- see page 7. 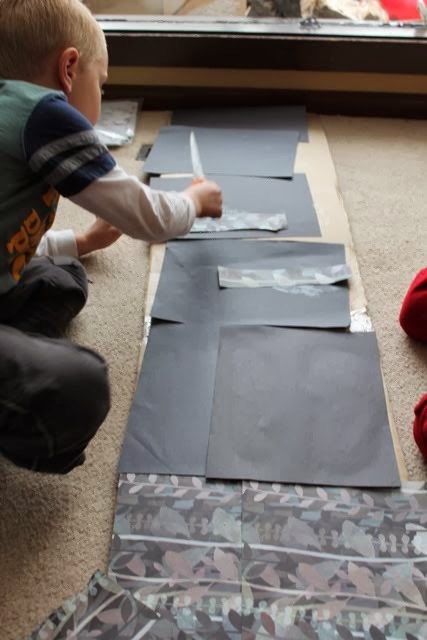 My children cut the pages into individual plants and glued them throughout their scene. 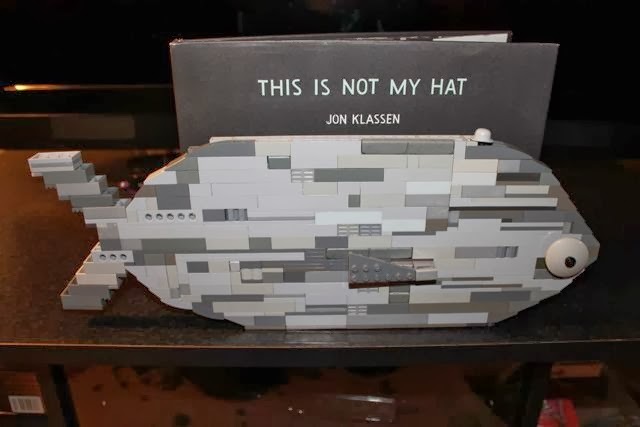 "This hat is not mine. I just stole it." 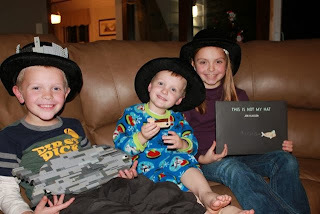 My boys acted out the whole book. There weren't costume changes but there were eye ball changes. We made differently eyes to show the different emotions of the BIG fish. I had questioned early on whether recreating the book with Legos was a good idea. I never realized that it would be a perfect way for my children to explore the subtleties of this book -- the eyes, the crab, the hat, the plants, the emotions. In order to retell the story they needed to know everything about it. We have been wearing these cool hats around the house all week. I found them on clearance after Halloween and knew they were pefect for our celebration. 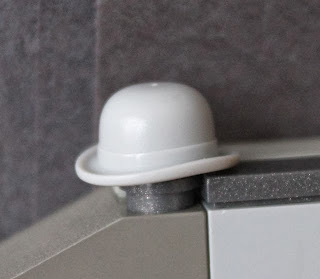 I love that my oldest son added the Legos to his hat. 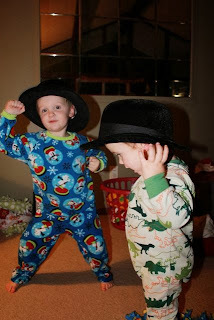 After our photo shoot, the little ones got crazy before bedtime with Hat Dance Party. Jon -- My family really enjoyed meeting you at the Mazza Museum and seeing you in Washington D.C. Thank you for sharing your birthday and for making books that all my children, ages 1 through 8, enjoyed this week! We hope you have a wonderful birthday!